Sure, things are pretty whacky here on Earth, but they’re nothing compared to the gigantic storm twice as wide as our own planet raging on Jupiter. 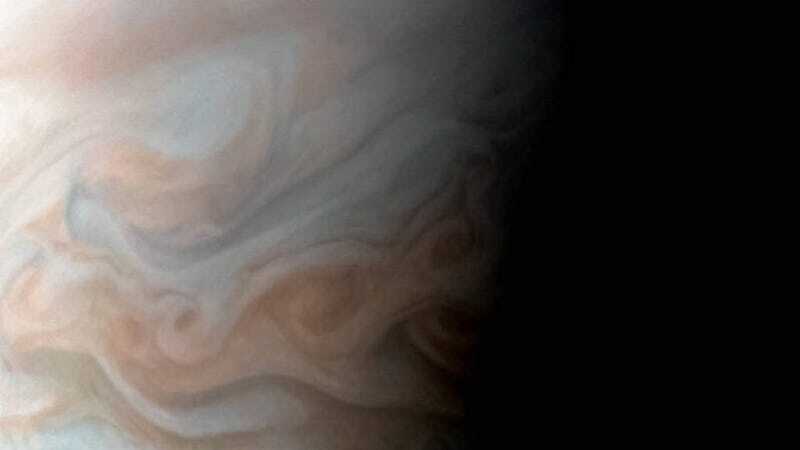 The area just west of Jupiter’s Great Red Spot is both dazzling and chaotic, filled with swirling clouds of mystery. Now, thanks to NASA’s Juno spacecraft—and a very skilled citizen scientist—we have the most high-res image of this region ever. The photo featured above was taken by Juno on December 11th, 2016. It was enhanced by citizen scientist Sergey Dushkin, as part of the JunoCam community’s project to make the spacecraft’s raw images look even more stunning than they already are. Here, we see a turbulent region located in Jupiter’s South Equatorial belt looking like a cup of coffee with cream rather than a raging storm. It’s admittedly kind of pleasant. Juno has been orbiting its gaseous companion since July 4th, 2016. On February 17th, NASA announced the spacecraft would remain in a 53.5-day orbit for the rest of its mission due to an engine anomaly, which is mildly frustrating, since it probably won’t be able to perform as many high quality data collection flybys as it would have with shorter orbits. That said, before Juno completes its mission, we’ll get lots of up-close-and-personal looks at our favorite gas giant. Get ready for many more lock screen backgrounds!